Brings news on research into the history of text presentation. Recent posts deal with my discovery of the world's oldest data visualization, the 5th-century Great Stemma. This blog also offers a way to comment on the www.piggin.net website and communicate with the author, Jean-Baptiste Piggin. Rediscovering a lost medieval work is the dream of many historians. It has come true for me in the last few weeks as a 6,000-word medieval commentary on a late antique diagram has emerged in my research. For 150 years, medieval manuscripts of Europe have been sifted and catalogued, but sometimes a big fat chunk of writing escapes the scholars' notice. Until now. This little opus is not easy reading: a Latin commentary which contends that stories in the Old Testament of the Bible foreshadow the life of Christ and the history of the Christian church. What is wonderful about it is its reflections on data visualization, a topic that directly concerns web designers, educators and scientists today. 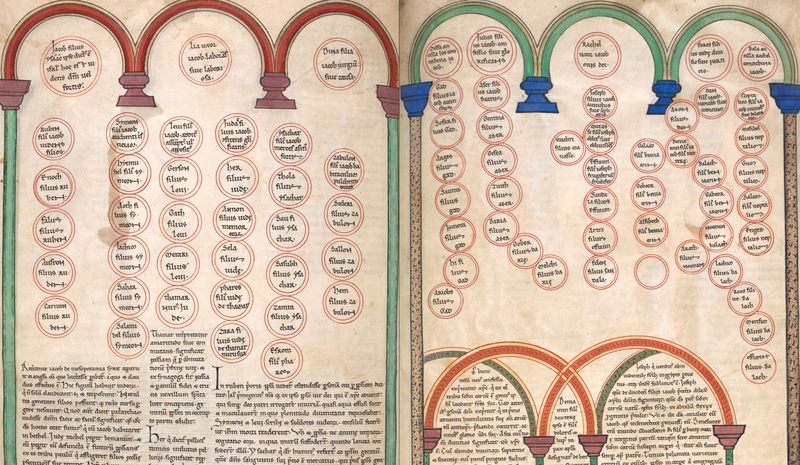 The commentary is written in gaps of the Great Stemma, a huge 5th-century diagram of biblical history and genealogy (reconstruction here), where the story proceeds from Adam at left to Jesus at right. The line is a string (funiculus) that a bricklayer pegs out to set a line of bricks to, and that's an interesting comment. A line of data, also described with another Latin word for a string, filum, is the fundamental unit of data visualization, whether it's a series of nodes in a network, an axis on a graph or dates in a timeline. The commentator also quotes Gregory the Great (c.540– 604), a writer who is a pre-eminent late antique source on visualization. Gregory was interested in omnivision, the all-seeing view. Gregory has a section (18.46) in Moralia in Iob where he disparages wisdom composed only of eloquent words (quam sunt verborum compositionibus) and contrasts surface perception (ante humanos oculos) with divine perception. The implication here is that you see things more truly in a diagram than when they are wordily explained. The commentator has quoted this passage in full in the opus. You can read the full transcription of the rediscovered Latin document on my website (sorry, I cannot translate Latin, but the passage from Gregory can be found elsewhere in English (scroll down to [xlvi]). I have provided links from my transcription to the digitized manuscripts. I can't yet tell you who the author is. Much of the little opus consists of quotes from the Expositio/Quaestiones in Vetus Testamentum by Gregory's contemporary, Isidore of Seville (560-636), so it could even have been composed during Isidore's lifetime. How did the document emerge back into the light of day? Like so many good things, it was hidden in plain sight. It is copied in four well-known 12th-century grand bibles: the Bibles of Parc, Floreffe and Foigy (all from monasteries in the Meuse valley) and the Romanesque Bible of Burgos in Spain. Three of them are online, so that counts as very plain sight. The epitome of Isidore is in the chunks of text at the bottom of this sample spread from the Parc Bible. As a wise observer commented to me, philologists probably overlooked the work because it is written in the gaps in a drawing. Scholars generally expect a serious work to appear in a manuscript as slabs of text, not interlaced with a genealogy. The key difficulty in disentangling the text was to determine which bits are the Isidorian enthusiast's commentary and which bits have other origins. Four strata in the development of the diagram as you see it above can be distinguished. The underlying diagram, containing 540 names written in connected roundels and extending the length of a papyrus roll, was devised by an anonymous patristic author to demonstrate the flow of Old Testament history and to reconcile a conflict between the genealogy of Jesus offered by the Gospel of Matthew and that laid out in the Gospel of Luke. The original state of this lowest layer is witnessed by a manuscript in Florence (Plut. 20.54, 11th century). 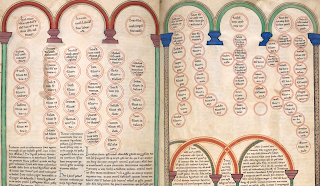 Its date prior to 427 and its extent is documented by a text known as the Liber Genealogus. The Great Stemma, as I call it, is the only known large Patristic diagram. As evidence of data visualization in western antiquity, its importance is only surpassed by that of the Peutinger Table of highways of the Roman world. The Christian diagram, of which 25 witnesses including the four bibles survive, is known to have initially circulated in early medieval Spain sub-sectioned into 18 codex pages. In one fork of its development, its solution to the contradiction between the Gospel genealogies was anonymously altered to conform to a theory by Julius Africanus. The Latin translation by Rufinus of the essence of that proposal was appended. This is the second of the strata in the version we are concerned with here, and is witnessed solely by a text-only abstract in the Bible of Ripoll at the Vatican (Vat. lat. 5729, 11th century). Imbued with the spirit of Isidore, the epitomizer later implanted the bible commentary on that surface. He or she entered many notes in the blank spaces to lay down a third stratum. In a final development, an editor, perhaps a northern European in the mid medieval period, prefaced the main diagram with an arbor consanguinatis figure and a brief text associating the diagrams with one another as symbols of Christ's cross. This fourth stratum, seen only in the three Mosan bibles (mid 12th century), has been recently analysed by Andrea Worm and requires no discussion here. Until we understand this stratification, we cannot recognize stratum three as a distinct entity. Only scientific investigation can extract stratum three from the matrix of words in which it has become fossilized. Scholars of Isidore will be excited at the emergence of this commentary, which contains the essence of the Expositio, at about one-twelfth of that work's length, since it illuminates the way the medieval world received and adapted the works of Isidore. I have thought a lot about whether Isidore himself might have created this version, since it seems to me, from my own experience of a lifetime of editorial cutting, that it is easy to expand a text by inserting interlinear words and phrases while keeping its syntax, but difficult on the fly to abbreviate a handwritten text while preserving its syntax, as this epitome does. That thought might lead one to the notion that this text could have been Isidore's own first draft. However I cannot yet see any definite evidence for that in the text. In fact, we cannot establish with any certainty where or when the commentary was written. I would tend to guess at 7th- or 8th-century Spain, but other scholars will have to take that issue on. For links to the digitized manuscripts and literature, check out my web page. The first part (1.1-3) argues -based on the story of Cain and Abel-that the Jews are unbelieving sinners and that they murdered Christ. In other words: classic Christian antisemtism. Jean-Baptiste Piggin is a New-Zealand-born historian. His work in the 1990s on a news-writing style guide and converting legacy documents to the web led him to establish the Macro-Typography guide in 2001. 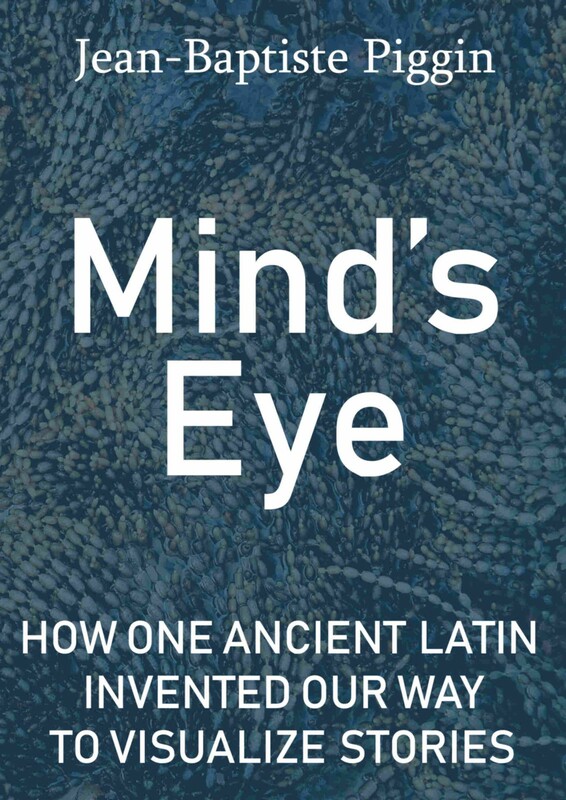 Since 2009 he has been investigating the history of Latin diagrams and maps. 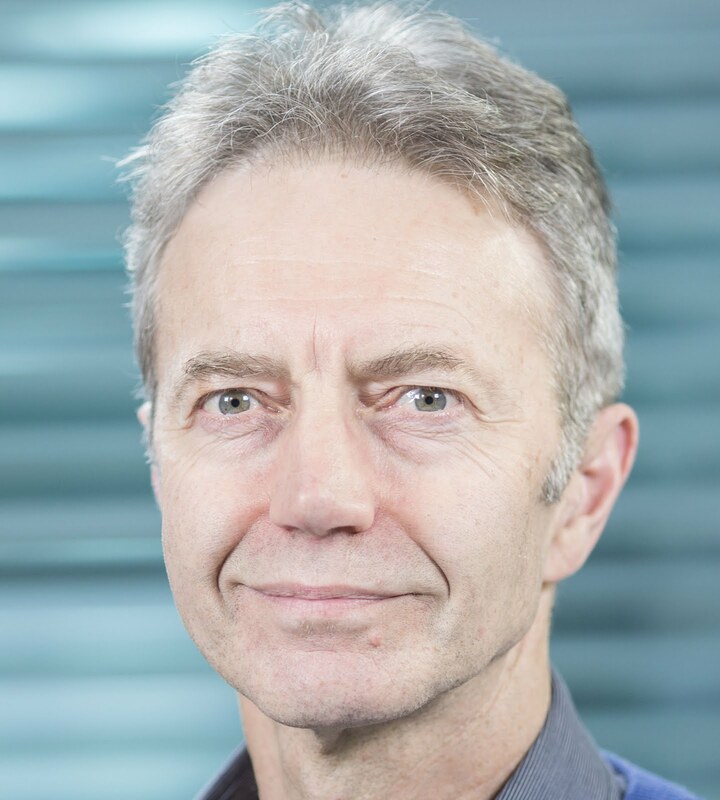 A graduate of the University of Auckland, he has lived in Germany for the past 35 years. His writing while a news-agency foreign correspondent on German life and politics appeared in newspapers and news portals worldwide.